The Treasury of the British Virgin Islands have launched (2nd August) two exciting coins which mark the 10th anniversary of the last flight of the Concorde air shuttle service. Regarded by many as an aviation icon and an engineering marvel, the supersonic passenger airliner known simply as “Concorde” made its final scheduled flight in October 2003. Jointly developed and produced by Aérospatiale and the British Aircraft Corporation (BAC) under an Anglo-French treaty, Concorde first entered service in 1976 and continued commercial flights for 27 years. Flying regular transatlantic flights from either London Heathrow or Paris Charles de Gaulle Airport to New York JFK or Washington Dulles in the United States, this amazing aircraft could complete its journey in half the time of normal passenger airlines. More than 2.5m passengers flew supersonically on British Airways Concorde flights. On 10th April 2003, Air France and British Airways both announced that Concorde would be retired later that year and in October 2003 Concorde landed at Heathrow Airport for the very last time. On this day, Her Majesty Queen Elizabeth II consented to the illumination of Windsor Castle to mark the occasion, an honor that is usually reserved for state events and visiting dignitaries, as the last westbound commercial flight left London. 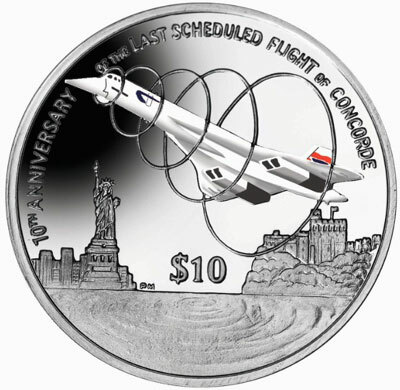 Struck by the Pobjoy Mint, Surrey UK, the design on the coin shows this amazing aircraft surrounded by rings to indicate the supersonic speeds at which it flew. Windsor Castle is also depicted on one side of the coin with the Statue of Liberty on the other with the Atlantic Ocean in between. The obverse of the coin carries an effigy of Queen Elizabeth II by Ian Rank-Broadley FRBS. Available in Cupro Nickel (BU) and Proof Sterling Silver, both versions will be available in colour which accentuates this important feat of engineering. For more information on these and other coins issued by the Treasury of the British Virgin Islands, please visit the website of the Pobjoy Mint at: http://www.pobjoy.com/ukworld/section.php/815/0 Information offered in English – international orders fulfilled.